An Irish gamer is to feature in EA’s latest Tiger Woods golf computer game, the gamer won a phone-in competition on radio station 2FM last September. The likeness of Stephen Brown, from Birr in Co Offaly, is to appear – above is a screenshot of Brown in Tiger Woods PGA Tour 08. He also got to meet and play against Tiger Woods (pictured below) in an EA Sports event ‘You vs Tiger’ at Leicester Square in London. The promotion was in part to promote ‘Photo Game Face’, a new feature in the golf game that allows players to up load their images into the game by just adding normal photographs. Tiger Woods PGA Tour 08 is set to be released next month for the PlayStation 2, Xbox 360, PS3, Wii, and PC, as well as on handheld systems the DS and PSP. The highly respected UK-based computer games website, EuroGamer.net has given ‘FIFA 06: Road to FIFA World Cup’ a score of 2/10, saying, “Really, to describe what EA has produced here as dreadful would be to do a terrible disservice to things that merely inspire dread”. The review was taken off EuroGamer.net after publication because of an embargo on the review until December 2, but can be seen in this boards.ie thread. From the in-game cameras angles you don't quite get this too often. Reviewer: Cian Ginty The advertisements promotes the fact the game is like bring a GAA football match into your home, the slowness of game play and the lack of any players images dilutes the likelihood of this actually happening. The stunning stadiums, Micheál Ó Muircheartaig’s commentary, and the only chance out there to play your county team in a computer game is outweighed by rough player animations, weird cameras angles (even if changing from the default view can help), and game play that doesn’t do the job of translating the speed and feel of Gaelic football into digital form. It has been suggested that the multiplayer aspect saves the games, even slightly. But we haven’t got the chance to properly test this theory. On an observational note, the lack of player names and images alone has been enough to put off a number of younger fans, who have been feed the idea of getting the 100% genuine product, coupled with the idea of sports stars as the ultimate celebrities. 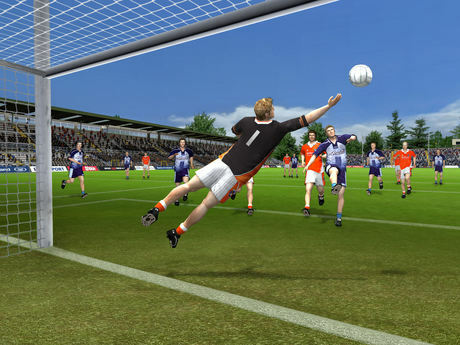 Some reports have reached Games Toaster that Gaelic Games: Football’s embargo was breached, with some stores in the Dublin area selling the game yesterday - something not uncommon for a high-profile title. The PlayStation 2 exclusive, GAA-endorsed game was officially released today. This evening on Today FM’s the Last Word, the GPA repeated their inaccuracy claim that "all" similar sports games for the PlayStation have the real player names and images included. 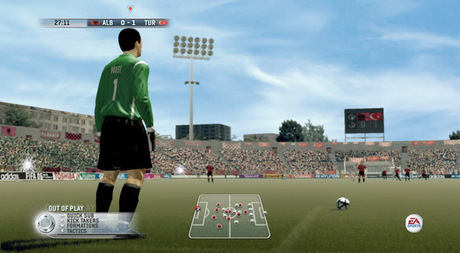 While even the majority of such games may use player images, including the high-profile FIFA line, not all do – for example, all past versions of the criticality acclaimed ‘Pro Evolution Soccer’ had no such licenses, and the Sony published title ‘This is Football’ was until recent years also infamous for not having licenses. Not having player’s images in sports games is a spoiler point for some fans. Meanwhile, Sony Computer Entertainment Ireland (SCE IE) has launched an advertising campaign for the Gaelic Games: Football. ‘Removals’, a TV ad is the figurehead for the campaign. It is set around the idea ‘Bring it home’, where removal men are bring some of the typical sights from a GAA match into the average looking home. In-game footage in an early edition of the TV advert circulated on the internet featured Mayo aiming and scoring an own-goal. From today, the final version is to air on “all channels”, presumably all Irish channels, and a 30-second edit will screen on over 300 cinemas. As support, a print campaign is said to be published “all main national newspapers” from today. The TV ad was made by the Red Rage Films, and the campaign is been managed by Dublin agency Cawley Nea TBWA, with media planning by Carat Ireland. PlayStation 2… It's everything we love about Gaelic games, in our living rooms. With this in mind, the campaign is underpinned by the phrase 'Gaelic Games: Football - Bring it Home' stated Marty Cowman, Creative Director of Cawley Nea, TBWA. Ronan McCormack, Product Manager, SCE IE, added that, “To support the games release, we have in place a major integrated campaign including television, cinema and press advertising, all based on the theme of 'Bring it Home'. Our advertising activity will be supported with a comprehensive PR campaign and extensive trade marketing activity into the new-year”. Games Toaster only received a copy of the game this evening. We hope to share our first impressing of the title after mid-day tomorrow. 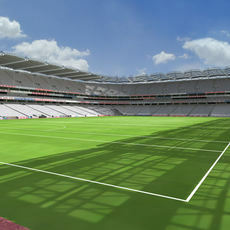 Above, the Armagh and Dublin teams, below Croke Park with Mayo and Kerry, and emtpy. Click on the images for a larger view of the screenshots. According to a press release issued today, the Australian games developer IR Gurus had 20 ‘designated’ staff working on ‘Gaelic Games: Football', it took over two years to develop, Croke Park and Fitzgerald Stadium took an in excess of 200 hours to digitalize, and each county jersey was close to 30 hours work. 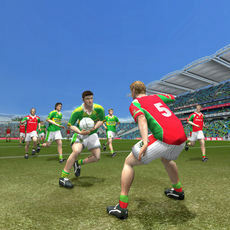 Gaelic football players based in Australia were used for motion capture, “The solo was one of the most difficult moves to re-create as it can happen at such high speeds. The motion capture shoot only took a day but it takes months to actually get the animations ready for use in the game”, stated the release.